Police are investigating after a sinister letter was sent to the home of the leader of Harborough District Council, threatening to burn his house down. The hand-written letter, with a match attached, was sent through the post to Cllr Blake Pain, who lives in Market Harborough. Cllr Pain received the letter on Saturday May 2, well before the election, he confirmed this week. The letter seems to be part of a concerted campaign to frighten council officials and councillors, over a planning decision which gave the go-ahead to 1,500 houses around the Airfield Farm site, north-west of the town. The letter was signed “A Lubenham Resident”, and had the same handwriting, and the same ‘signature’ as one of two threatening letters received by Harborough District Council at their Symington Building HQ in Adam and Eve Street in March, Cllr Pain said. Cllr Pain condemned the “vicious and vile threats against people only trying to do their best for their community”. Leicestershire Police confirmed they are investigating the circumstances around a threatening letter sent to a house in Market Harborough on May 2. The letter will be examined forensically, a police spokesman said. The letter with a match attached said that if Cllr Pain did not burn his own house down, the letter writer had “all the time in the world” to do it for him. The letter-writer also mocked Leicestershire police, saying they were even more stupid than councillors. The council’s planning committee gave the go-ahead to three applications for a total of 1,500 houses around the Airfield Farm site north-west of the town, at a meeting attended by 250 people at the town’s Market Hall on March 2. The decision was reached on the three proposals after about four years of consideration. Shortly afterwards, the first two threatening letters were received at the council’s headquarters, one threatening to burn down the homes of councillors or officers, and the other threatening an anthrax attack. 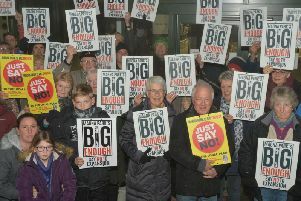 A council spokesman said at the time: “The council received two threatening letters in the post which appear to have been sent following the planning committee’s consideration of the planning applications for the north-west Strategic Development Area. Cllr Pain pointed out that all parties agreed that new houses should be built north-west of Harborough, and the differences were over the scale of the building. He said development to the north-west of Market Harborough had been talked about for 20 years, and he would do his best to ensure that new development did not change “the essence and the character” of Market Harborough. Cllr Pain added that anyone with information about the letters should tell the police. The police spokesman said that anyone who can assist with the police enquiry should call the police on their 101 number.